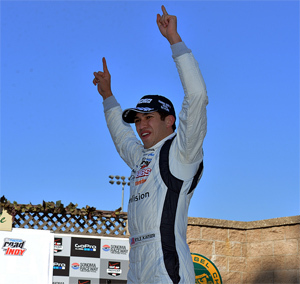 Sonoma, Calif. – Kyle Kaiser, from nearby Santa Clara, Calif., this afternoon celebrated his first victory in the Pro Mazda Championship Presented by Cooper Tires following a fine performance for Juncos Racing at his home track, Sonoma Raceway. Equally significant was the Lap 4 collision between title rivals Spencer Pigot and Scott Hargrove which ended with series points leader Pigot on the sidelines and Hargrove in third place. Hargrove, who won last year’s Cooper Tires USF2000 Championship Powered Mazda, is now in the catbird seat as he bids to become the second driver in successive years to claim back-to-back titles in USF2000 and Pro Mazda. The 19-year-old from Vancouver, B.C., Canada overturned a 19-point deficit and now leads Pigot by two points entering tomorrow’s season finale. The start was relatively uneventful as Hargrove maintained his advantage from pole position to lead outside front row qualifier Pigot past the green flags. Entering the tight Turn 11 hairpin on Lap 2, however, Hargrove locked up the brakes on his Cape Motorsports with Wayne Taylor machine as he struggled to keep Pigot in his mirrors. Next time around he did it again, this time running wide at the exit and allowing Pigot to take a tighter exit and take the lead as the duo accelerated toward the start/finish line. Unfortunately, contact between the pair on the uphill climb to Turn Two sent them both spinning. Pigot was briefly able to continue but his Juncos Racing car’s left-hand sidepod was severely damaged, causing the engine to overheat and ultimately expire just a few corners later. Several other cars also spun on the spilled fluid, bringing out the caution flags for a lengthy cleanup. Kaiser took advantage of the melee to move into the lead but remained under intense pressure from Hargrove’s teammate, Neil Alberico, at the restart before edging clear in the closing stages to secure the victory. Hargrove briefly passed Alberico for second with a fine move under braking for Turn 11 on Lap 10, one lap after the restart, only for Alberico to retaliate immediately and regain second place on the entry to Turn Two. That’s the way it ended, with Kaiser taking the checkered flag 1.6194 seconds ahead of Alberico, with Hargrove in third. Shelby Blackstock (Andretti Autosport) looked set for fourth until experiencing mechanical problems in the waning laps. He eventually nursed the car home in fifth behind Nicolas Costa (Team Pelfrey). Alex Keyes, from Folsom, Calif., drove impressively on his Pro Mazda debut to rise from 13th on the grid, passing Dalton Kellett (Team Pelfrey) on Lap 13 to snag sixth at the finish. Stan Kohls finished 16th to earn top Expert honors (for drivers over 30 years of age) over World Speed Motorsports teammate Bobby Eberle, for whom second place was enough to clinch the season title. The Team Championship is even more finely poised than the drivers title-chase, with second and third-place finishes for Cape Motorsports with Wayne Taylor Racing ensuring a single-point advantage over Juncos Racing prior to tomorrow’s season finale which will start at 3:40 p.m.
Keyes took home the Quarter Master Hard Charger Award for a gain of seven positions from 13th to sixth. He also claimed the Staubli Award. Joey Bickers with World Speed Motorsports gained three positions following the restart on Lap 10 to earn the RePlay XD Move of the Race Award. The PFC Award and customized Race Energy charger – the official battery of the ladder series – went to the winning team, Juncos Racing.